Tinka B. Prekovič is an architect, writer and editor from Slovenia. Her interests include architecture, art and curiosities. She designed a post stamp at 21, invented an utopian infrastructural object called Fatamorgana for her diploma work and received various prizes and awards for her work. Currently obsessed with mirrors. 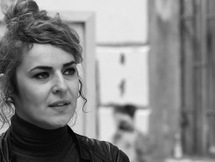 She is member of the editorial board of Outsider, a ground-breaking Slovenian magazine for architecture and art. She is continuously searching for the strange, beautiful, borderline, obscure, banal and unusual. A story digger and a story teller. She is searching for architectures and urbanisms which were designed or destroyed by excessive passion, random wants, unfortunate coincidences or construction flaws, or simply designed and built to exist for a limited time. The abandoned La Cupola is one of the first great little stories she found for Architectuul. In 2012, she started to develop her own brand TINKA PREKOVIC OUT. Her OUT is a collection of narrative objects, with their practical aspect taking second place. OUT is a brand for out-of-the-ordinary, representative, limited edition objects. Her expression language moves between the surreal, irrational, kitsch and timeless aesthetics. Ancient Byzantium enters digital era.